Follow your own spiritual path. 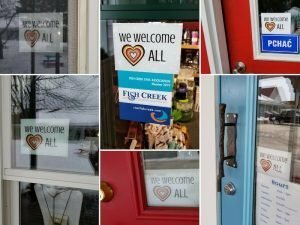 We Welcome ALL is a new social justice initiative in Door County that affirms the worth, dignity and respect of all individuals. The initiative is supported by a collaborative of eight non-profit organizations and faith communities that seek to foster a welcoming community for all people who live, work, and visit in Door County. The co-sponsors of We Welcome ALL include: Door County Civility Project, Ephraim Moravian Church, Hope United Church of Christ, JUST Door County, PFLAG Door County, St. Luke’s Episcopal Church, Stella Maris Parish, and the Unitarian Universalist Fellowship of Door County. These organizations have made a commitment to offer programming on diversity, acceptance, inclusion, and welcoming through workshops, presentations, films, book discussions, and deep conversations. The co-sponsors and business participants recognize that despite their good intentions and efforts, not everyone has always felt welcome and included in our communities and in our county. They acknowledge that because of race, immigration status, refugee status, religion, sexual orientation, ability, age, gender identity/expression, and more, some people have experienced harassment and discrimination. The We Welcome ALL initiative raises awareness and sensitivity to those potential situations. Those who support this initiative seek to remove barriers created by prejudice and build bridges of trust and understanding. In order to safely address acts of harassment and discrimination, a Bystander/Upstander Workshop is being offered on April 30th from 9-3:30 at Kress Pavilion in Egg Harbor. Tracey Robertson from FIT Oshkosh, Inc. will be presenting. Tracey and FIT Oshkosh have recently won awards for their leadership and unique approaches to diversity education, advocacy, and racial literacy (www.fitoshkoshinc.org). Register for this workshop at www.doorcountycivilityproject.org. Anyone interested is welcome to attend. Door County has a fine tradition of welcoming those who live, work, and visit our peninsula; yet we can do even better. Let’s make sure that everyone feels welcome here! If you are interested in becoming a business participant, please contact Paula Christensen, We Welcome ALL Coordinator at wewelcomealldc@gmail.com.